I'm currently working on finishing up the family room & kitchen. If you've seen my boards for these rooms on pinterest, then you probably already know that I'm all.over.the.place! The one thing I know for sure is that I want comfort and coziness. The family room has been, by far, the most difficult room to decorate for me. I think there's a combination of reasons for why that is, but the primary reason is that I never really had a plan for the room. Even though I probably thought I did lol. I've been trying to fix bits and pieces and really, that's only a temporary fix in the end. I need to make decisions. So here we are, nearly four years later and I'm not touching a darn thing until I figure out the space. We've considered creating a library with cabinets and shelving along the long wall, but we just can't seem to bite the bullet on that idea. Though I would love to replace the couch and chairs, because they are on the large side, we just aren't ready to do that yet, dolla dolla bills yo! One day I shall have a gorgeous velvet rolled arm sofa and stunning chairs across from it. I did almost buy some wingback chairs to replace the brown leather ones, because even that change would be amazing! But I wasn't sure if wingback chairs would be the best for watching tv? The plan is to try to locate a stunning mid century modern credenza, similar to this (my husband loves this). I've already lost out on three on kijiji! Gosh those things go quickly. 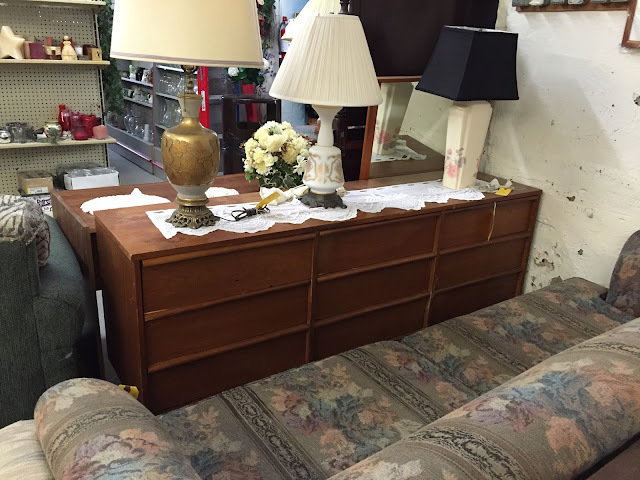 The one pictured below almost came home with me out of desperation lol, but we need both cabinets and drawers to hide the stereo equipment, so I left it behind. Plus, it wasn't all that sturdy, which of course, is no good. 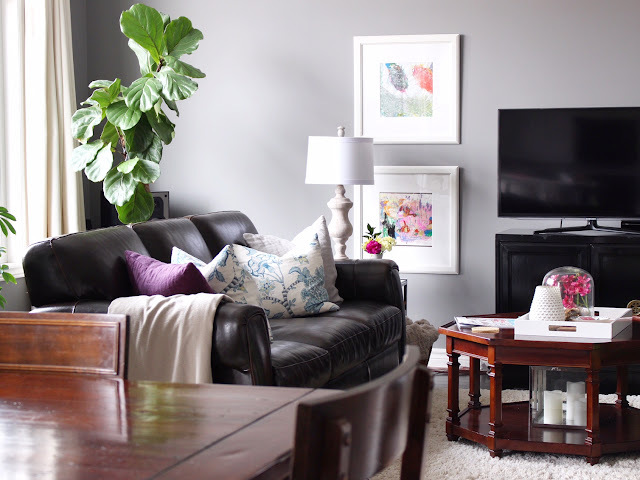 The credenza also needs to be long enough to hold the tv and two lamps, loving this look and then I'd love to hang gorgeous art around it. Then in the corner, next to the window I'd be happy with a vintage bookcase and a cozy seat with a lamp for reading. The rug also needs to go, I'm considering jute or a blue or grey one. For colours, I'm leaning towards blues and purples. Since the rooms are north facing and the walls are grey, we need a bit of colour to add warmth. Maybe some splashes of yellow and green? We also need to replace the stools at the kitchen peninsula. There isn't much space between the chairs at the table and the stools, so I'd prefer to have something that took up less floor space and that would easily tuck under the counter. Again, until I finalize the plans for the family room, I'm not quite sure what it is I want for there. BUT! I'm loving, these A LOT. Finally, I'm planning on replacing the IKEA dressers that are currently flanking the fireplace with cabinets. For more of a built-in look. The dressers will move up to our bedroom and be used as side tables. So yeah, lots to be done! This past weekend I found this fabulous tufted ottoman (at an incredible price) and thought that finally the room was going to start taking off! I knew that it was on the small side, but thought that it may just work....sadly, it did not and back to the store it went. 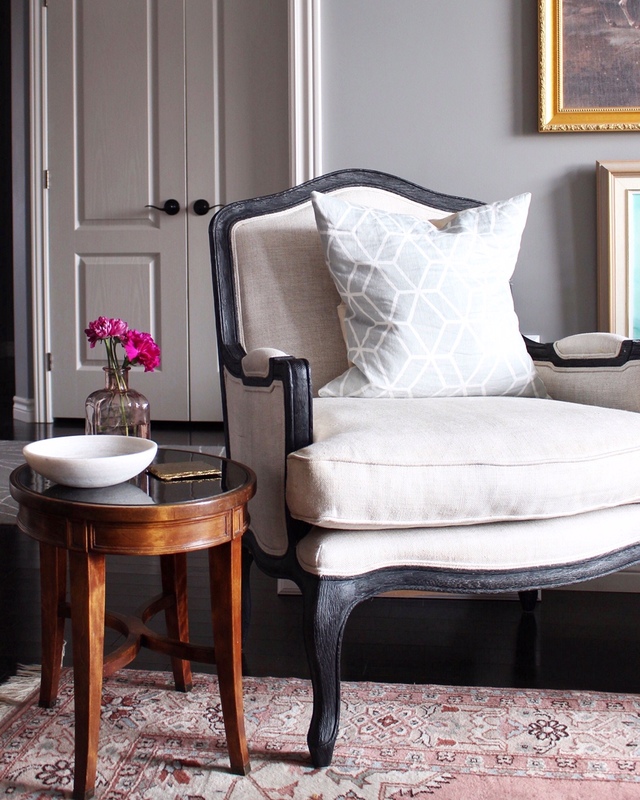 That being said, it felt great to know for certain that a tufted ottoman is indeed what I'd like to have as a coffee table so that we can easily kick our feet up. I love the idea of it being square, I'm nervous that a rectangular one will be too much for the room and I'm not certain that oval is the answer either. So square is currently in the lead. To help myself create a game plan (a little ode to the Super Bowl) I've dismantled the bulletin board in my office and I will be adding a slew of images and fabrics to help me decide and visualize what it is that I want to do with that room. In other news, I've been in the process of getting rid of things that we don't love. This was long overdue and it feels great! Anything from decor, to clothing to kitchen gadgets. I'm even taking pieces off of the walls and leaving empty spaces because as I mentioned on instagram, there's no sense keeping items that we don't love just to fill voids. I'd rather look at the empty wall and wait for the perfect piece! Phew! Okay, after all of that, how about we finish the post off with a dose of pretty?! I'm loving the colour of these flowers! 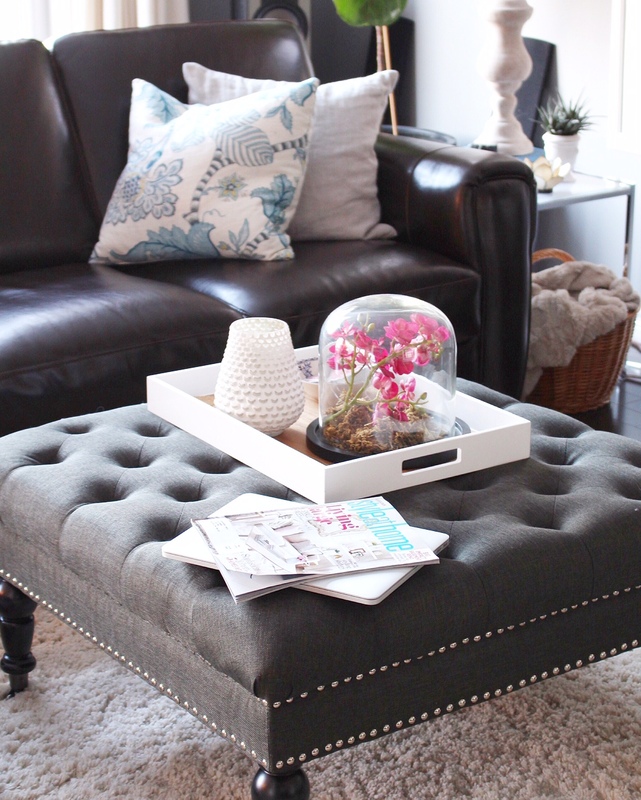 I have a similar ottoman in my living room and its a good addition I think, only issue it that I cant get my husband off it!